U.S government has provided eleven armored personnel vehicles (APVs) worth over 280 million rupees ($2.7 million USD) to Pakistani police agencies on Wednesday. On December 13, Acting Deputy Assistant Secretary of State David Ranz officially handed the vehicles Pakistani police agencies. These APVs, provided by United States Embassy’s International Narcotics and Law Enforcement (INL) section, would be distributed amongst Islamabad Capital Territory Police (ICTP), Frontier Constabulary (FC) and Khyber Pakhunkhwa (KPK) police to improve their professional capabilities. The delivery underscores the U.S. government’s commitment to working with Pakistan to improve security for the Pakistani people. 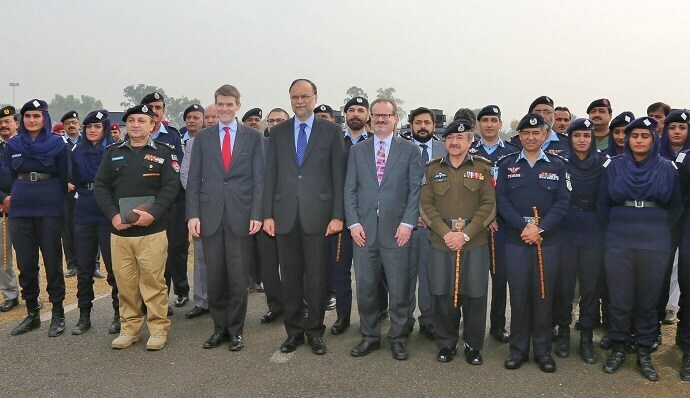 Interior Minister Ahsan Iqbal, ICTP Inspector General of Police Dr. Sultan Azam Temuri, Frontier Constabulary Commandant Liaqat Ali Khan, and KP Additional Inspector General of Police Dr. Muhammad Naeem Khan attended the event. American company Lenco built the vehicles, which are able to maneuver in remote and difficult terrains, helping civilian security forces prevent and respond to crime, terrorism, and militancy. APVs are critical in improving police operational capacity and saving officers’ lives as they respond to threats from armed groups, including terrorists, militants, and narco-traffickers. Across Pakistan, these groups target police officers. According to the National Police Bureau, almost 6,500 police died in the line of duty in Pakistan.